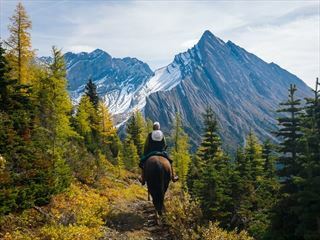 Nestled amid the snow-capped mountain peaks of Banff, Mount Royal is a perfect choice for those in search of comfort, exploration and beauty for their Rocky Mountain adventure. The hotel exudes an elegant yet cosy atmosphere, greeting you with friendly staff and a warm lit fireplace in the lobby on your arrival. 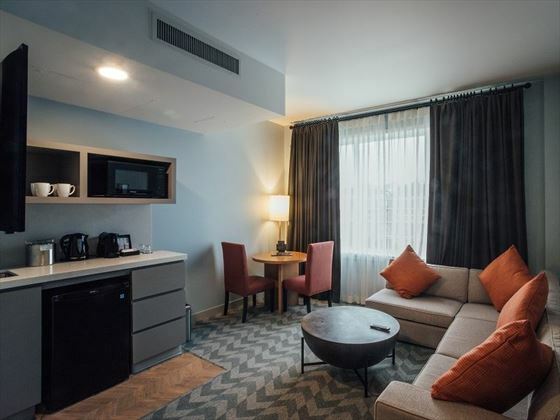 Each room is comfortable and well-appointed with plush signature beds, eclectic decor and premium amenities, all featuring views of the surrounding landscapes or majestic mountains, in addition to complimentary Wi-Fi, king-sized beds and gorgeous en-suite bathrooms. The suite option further treats guests to completely uninterrupted vistas, a kitchenette and a heightened level of private living space. 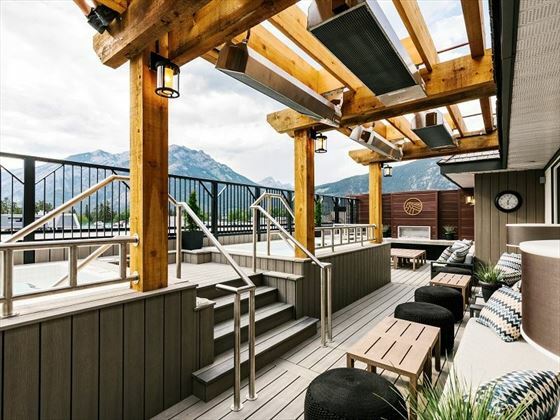 After a busy day out in the Rockies exploring the famous national park, there isn’t anything better than chilling out at the hotel’s rooftop hot tub with a drink or two from the adjoining rooftop lounge – the mountain views from here are simply astounding. There’s a variety of restaurants to enjoy too, from a traditional Canadian pub serving a plethora of the nation’s hearty specialities and craft beers, to the newly-opened Tony Roma’s restaurant, which serves succulent BBQ dishes in a casual, friendly atmosphere. 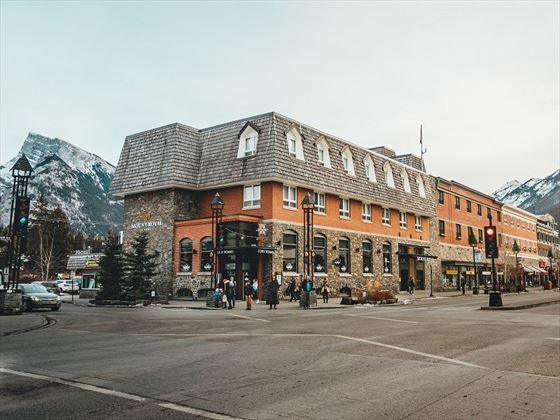 Set in the heart of Banff, this hotel offers a prime location to explore the glorious Rocky Mountains and Banff National Park, in addition to the rich history and fantastic attractions in the area. The famous Banff Gondola up to Sulphur Mountain is just a 5 minute drive away from the hotel, and the picturesque Lake Minnewanka is just under 9 miles from the property. 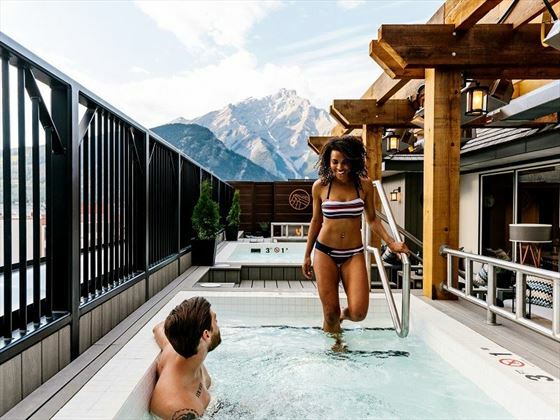 If you’re looking to unwind in the great outdoors, Banff Upper Hot Springs is just over 2 miles away – a wonderfully serene and relaxing experience after a busy day. Calgary International Airport is an hour and a half drive away from the hotel, and there are shuttle services available to book from the airport to Banff (additional cost). 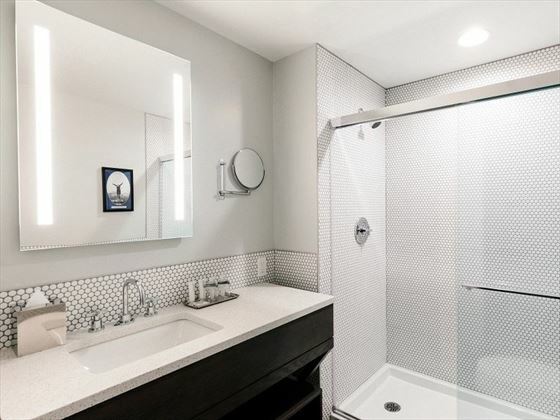 Overlooking lovely views of Banff or the surrounding snow-capped mountains, these well-appointed rooms are contemporary and incredibly comfortable. Appointed with unique, stylish décor, these spacious rooms embrace beautiful views of either Banff Avenue of Tunnel Mountain. 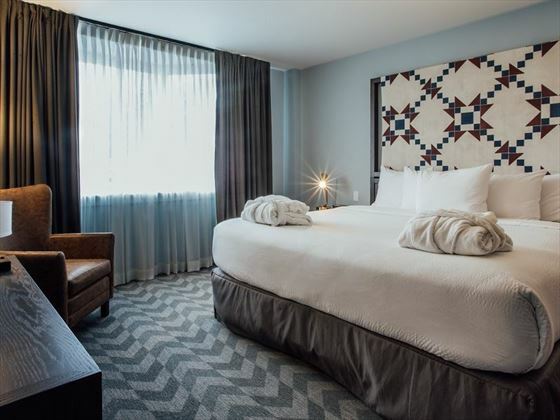 Cosy and charming, these slightly smaller rooms are located in the Cascade Building (involves stairs), and offer limited views of Banff or the beautiful surrounding mountains. 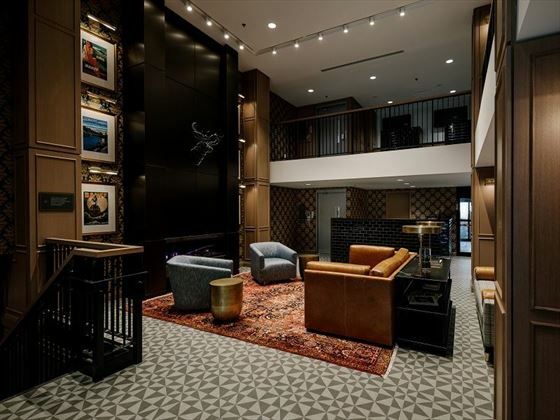 Each suite offers a wonderful touch of grandeur with plush furnishings, well-appointed décor, lots of living space and incredible, unobstructed views of Banff Avenue or Tunnel Mountain. Inspired by all things Canadian, Toque serves a menu of the nation’s mouth-watering favourites, including the classic poutine, a collection of Alberta beef burgers, specialty sandwiches, craft-beer battered fish and chips, bison sausage and more. You can also enjoy an extensive craft beer list, in addition to special event nights with a bustling atmosphere. Newly opened in October 2018, this is a wonderful restaurant with a casual, laid-back atmosphere, famous for its succulent BBQ ribs, slow-roasted chicken and AAA Alberta beef. 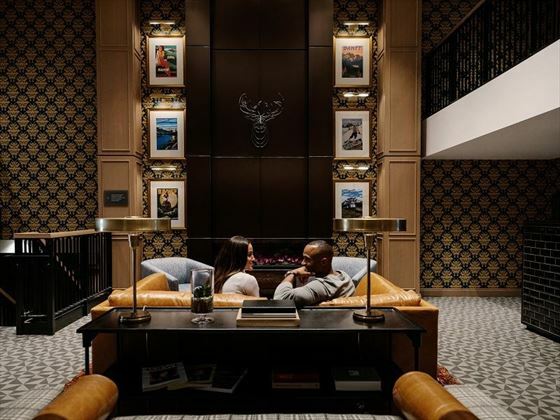 Also recently opened in September 2018, this ambient lounge is located just off the hotel’s main lobby, the perfect spot to sit back and relax with an extensive beverage list after a day of exploring the vast mountain scenery outdoors. Located on the second floor lobby of the hotel, this is a great spot to stock up on grab-and-go healthy snacks for your mountain adventures. 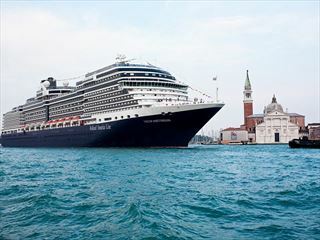 With indulgent suites, luxurious amenities - including a pool and a casino - and plenty of opportunity to unwind, Nieuw Amsterdam offers a luxury experience.